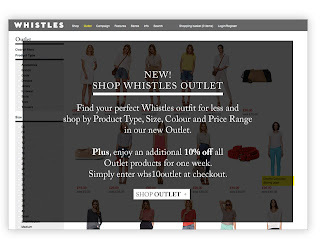 We make no secret of being big fans of Whistles. Chief Executive, Jane Shepherdson (former Topshop Creative Director) joined the firm in 2008, and coincidently since then thats when we've found the best pieces from the brand. Their styling is second to none, and their clothes last forever. This top would be my pick, it's gorgeous. 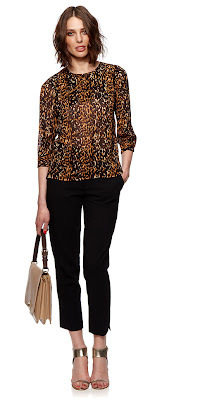 Perfect for either the office or the weekend, and with real style that cannot be purchased elsewhere, even though most other stores are also trying to compete with leopard print styles. With 100% silk, this really is on another level of quality - I want that models hair too! Buy it here for £110. Firstly, this gorgeous Lina leopard print dress from the clever design team. This dress style has been carried over from their SS11 collection, and it's a real dream. The cute peter pan neck is a new and welcome addition. We love it, and £150 - buy it here. It wasn't a huge surprise that the Carrie skirt was continued, after it's phenomonal success in pink and yellow over the summer. If I had a pound for every one of them I saw over in London, I'd be a rich lady - which sadly was the only off putting thing about them. Their style and design suit so many, you just have to remember that the shorter you are the higher the heel you needed to wear with them, in my opinion. Here is a leopard print version here for £135. And last but certainly not least, this gorgeous angora wool cardigan. I've seen this for myself and it is LUSH. Cardigans are perfect accessories, as they make fantastic add on pieces especially if they are patterned and the rest of your outfit is plain (such as in the office). This one is brilliant, adds a little bit of cool into your Monday to Friday look. Buy it here for £95. thanks to writte me!!!! i going to follow u!!! you blog is great!! !